I everybody This is my starting ramp it's completely dismantled and i can put the ramp inside my Toyota Sienna. And i can built-it in 10 minutes. Last edited by Eric Brassard on Mon Mar 20, 2006 9:25 pm, edited 1 time in total. hey thats really cool! What materials did you use? How High and what trany are you using?I've been thinking about re-doing the ones for The Dovercourt Open this year. I Claude , I am very happy to talk to you.The hight is 36 inches but you can reverse the trestle and you have a 44 inches ramp.The top trany is 60 inch and down is arond 72 inches. The platform have 36 inches by 48 inches. I made the frame whit 2X6 and the top 5/8 veneer.In the back of the platform it have a skateboard stop ( in red on the picture)is made whit 2x3 and i cut 1/4 of the piece. The escalator is made whit 2x6 and fix it whit the door hinge. The trestle is made 2 x4 .The front trestle is double (check the picture) The cossing is made whit the électrique tubing 1/2. The trany frame is made 2 x 10 for side and 2x3 for back. The roll surface is made whit 3/8 veneer. All the top roll surface is made whit masonice. I renforce the top down of the trany whit a métal plate. All wood is fixe whit screws 1 1/2 and 3 inches. If you need some more information just ask me or you you can talk whit Pierre Gravel he try it last fall. The Québec crew hope you can go to ride whit us this spring. Eric, the ramp in your post is very cool. Is there a specification that most competitions use (I'm new back to the sport)? Just curious if I was to build one or two I would want to match them as closely to AM or PRO spec as possible. Thanks for sharing all the info! 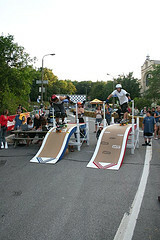 I Stephen, they have not really rules whit the starting ramp. Some compétition use the push start.But whit this ramp the big utility is it complete dismantle and the weight is for all parts 200 pounds.If you need the computering sketch just ask me. Eric Brassard wrote: I everybody This is my starting ramp it's completely dismantled and i can put the ramp inside my Toyota Sienna. And i can built-it in 10 minutes. Yeah Guy The Québec Ramp make a Baby IT'S TWINS!!!!!!!! While I'm certainly not the fastest, I have been around a bit. Your ramps are a pleasure to ride, and provide an excellent opportunity to pump off the ramp. I'd encourage anyone looking to build a ramp for practice or race day to give Rick a shout. In addition to the experience the ramps provide skate wise, they go up and tear down fast, and amazingly pack up in a mini van. In any case, nice work!! I'd be hard pressed to top that, and lucky if I could copy it correctly. Now, where'd I leave my saw?? Thank's Guys, I appreciate your comment. I'm Happy and honored,if i can do something more for the sport just ask me. I think it's a good idea if everybody have the same starting ramp. When the racer will arriving at the course anyone is penalyse.I have a digital plan and i can help everybody by E-mail for construction and how to do it. P.S Eric the Winstar is a litle bit larger than the sienna and you saw is at your neighbor. Ha Ha Ha!!!!!! 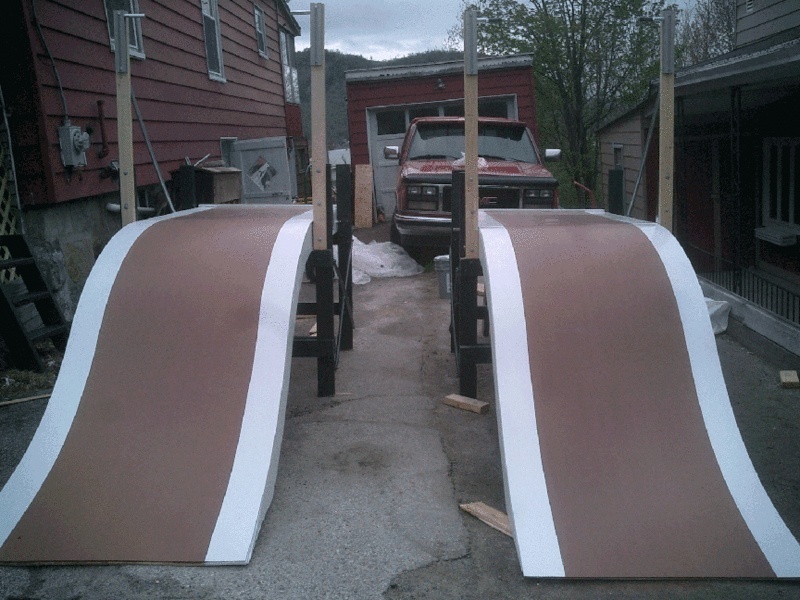 Québec Ramps at the fortress outlaw..
Tim did a great job building them exactly like yours Éric. HI, I have a new plan version of my québec Starting Ramp. If somebody need it just ask me .....it's Free. Eric, I would be interested in seeing your new plans. We may or may not be having a single lane hybrid race on the JFX in Baltimore as part of the Jones Falls Celebration this September. 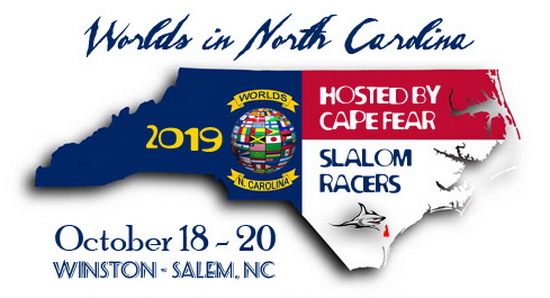 They invited us to do one last year but the festival didn't happen due to lack of a title sponsor. Either way I would like to build a starting ramp and like your approach. You can download the plans for Éric Brassard's "Québec Ramp" in PDF. If I may be so bold as to make a suggestion? I looked at the PDF plans for the first time and found them an excellent design. Just one idea, though. When I built my ramps I used 2x2s as the cross pieces supporting the "S" ramp. It sounds like a small change but the real advantage is it makes the component much lighter and there's no loss of strength. I assembled mine by using three wood screws across each 2x2 cross piece and it's firm as a rock. But did Mig try it? The plan is there as a guide, i made the drawing according to Ricks specs but like with a good receipe book, you can make it your own by changing a few things. This is a great design! I've made my version of it- thanks for posting the plans! Wow pretty cool Willy, they are exactly like the originals! 2) The platform legs are the same width as the platform itself. This is a deviation from the plan. Technically, it happened this way because I wasn't thinking, but turned out pretty nice regardless. I can bolt the legs to the platform with 5" bolts. 3) I used black pipe (and fittings) for the handles. This is fairly costly because black pipe fittings are not cheap, but it is very rigid. Thanks again, Eric, for the fantastic design! Hi everybody, I know many people build the Québec Ramp years after years....please send a picture and where is the ramp is locate. I want to know the look and the modification (amélioration) you do.